Don’t just see Hawaii’s natural beauty – live it firsthand with Hawaii horseback riding tours. 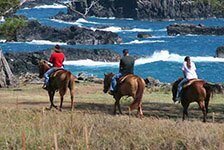 Hawaii horseback riding tours and trail rides let you experience waterfalls, valleys, beaches and more on horseback. Book your horseback riding in Hawaii adventure today for great savings.